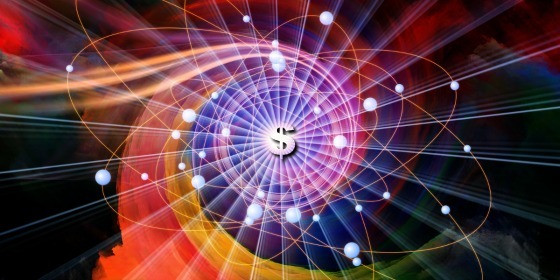 Quantum Treasuries in a Quantum State?Quantum Treasuries in a Quantum State? Quantum Treasuries in a Quantum State? The discovery of the quantum is one of the great breakthroughs in science. It helped transition our understanding of how natural phenomena work from Newtonian mechanics to quantum physics. In this whacky world of infinitesimally small particles, Heisenberg’s Uncertainty Principle was formulated which postulated that a scientist cannot simultaneously know the position and momentum of a particle because trying to measure either one will affect the results of the other. It now became impossible to separate the observer from what is being observed because the mere act of observing impacts what is being observed. This principle was hugely important to George Soros in developing his investment philosophy and this is one of the main reasons he named his extraordinarily successful hedge fund The Quantum Fund. One of the hallmarks of the quantum is that it represents a discrete amount of energy that must be present before certain events can take place in the world of matter and energy. For example, electrons can only move to new orbits when they have reached quantum states. This creates great stability until a quantum event takes place which temporarily disrupts that stability and a new state emerges. I am by no means any kind of scientific expert so I am sure I am making this far more simple and possibly inaccurate than it really is but hopefully, you get the general picture. From an investment standpoint, I am wondering whether U.S. Treasury securities have reached a quantum state where they may experience a meltdown in yields. Rather than being viewed as a “risk off” hedge and trade, perhaps a quantum leap may be in the works in which it becomes a tremendous “risk on” trade capitalizing on what is a seemingly black hole capturing most developed country sovereign debt into negative yields, including the potential of U.S. Treasuries follow suit. I’m not saying U.S. Treasuries will go negative, but perhaps the 10-year will go down to 1% or so given the tremendous yield premium it has over the rest of the world and will continue to have at 1%. 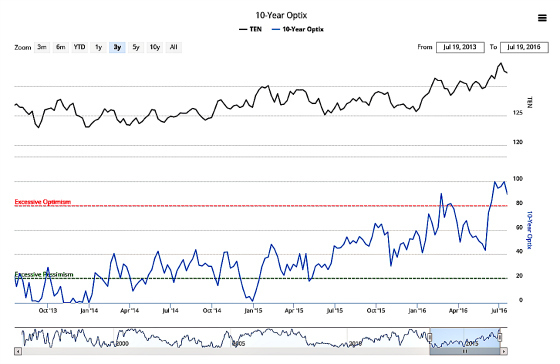 And if this takes place then this can offer a very good return for purchasers of 10-year Treasuries. The following chart seems to suggest this may already be happening. The rest of the world seems to be dropping into negative territory or very close to it due to quite weak growth dynamics strongly impacted by rapidly aging societies and in some cases (e.g. Japan) shrinking populations. While the United States is aging too and has a slower growing population and labor force, it is far more healthy than Europe and Japan. It is also closer to full employment. 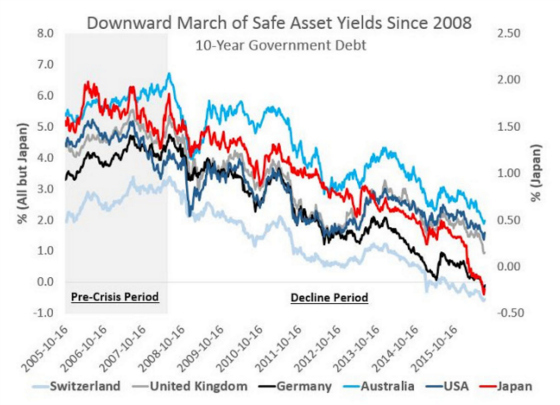 And yet, yields here are being sucked into the vortex of the world having over $10 trillion in sovereign debt with negative yields. It used to be that U.S. Treasury yields would drop during risk off trades where investors would flee risky investments for the safety and security of Treasuries. This now may be changing as I alluded to earlier. Despite record highs in the stock market and the fading of Brexit fears, 10-year Treasury yields keep moving down. One would think that yields would be higher than they were then before the Brexit vote as the stock market is now at new highs but this is not the case. The yield prior to Brexit was 1.74%, it dropped to a low of 1.37% after and now is in the 1.57% range. 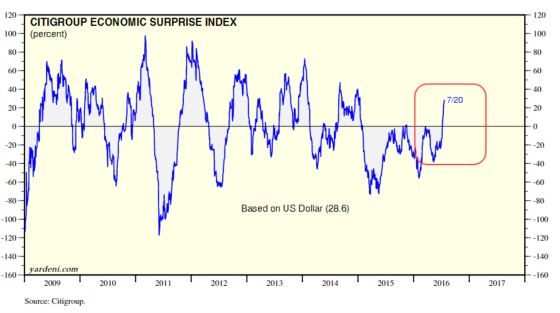 The next charts are from #soberlook and show how economic surprises have gone from being negative surprises to positive and how risk appetites have changed quite dramatically among investors. These would suggest meaningfully higher Treasury yields, but this has not been the case as the above chart shows. 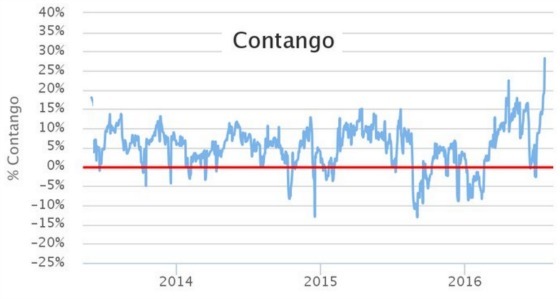 The VIX curve keeps steepening (higher contango), which tends to indicate higher risk appetite. 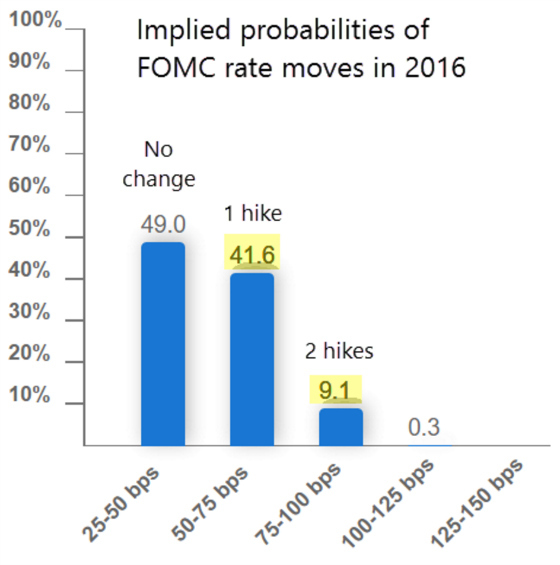 This has moved the implied probabilities up for U.S. interest rate hikes. 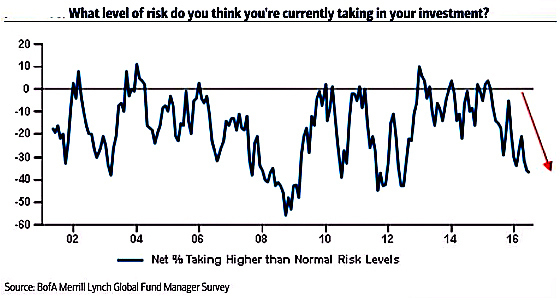 Despite the higher risk appetite, investors are still heavily allocated to cash and risk averse. This speaks to market pullbacks being more short term corrections than a bear market reversal. Treasuries should do well during pullbacks and because the Fed will have a difficult time raising rates meaningfully due to the U.S. dollar. The Fed is observing economic strength and yet, in doing so, is taking actions affecting what it observes by ending up weakening it. Heisenberg’s Uncertainty Principle at work to some degree. As I have written about before the Fed faces a challenge of an appreciating U.S. dollar every time it signals it wants to raise short-term interest rates in the face of improving economic news. 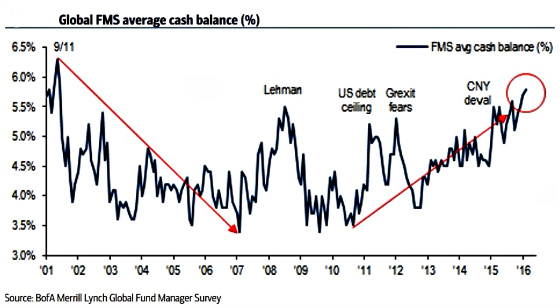 It then triggers a dollar rally which hurts U.S. multinational firms and tightens up credit conditions overseas because so many foreign firms and countries have borrowed in dollars. A strengthening dollar makes repaying those debts more expensive and can have negative economic repercussions which can feedback to the U.S. While the dollar has corrected some in the wake of the very weak jobs report in May, it still looks like it is in a bull market trend and poised for acceleration once the Fed signals a strong willingness to raise rates. It has the classic bullish pattern of higher lows and higher highs. Japan is going to implement a very large stimulus package which is already weakening its currency and the European Central Bank said that it will continue with its $88 billion corporate bond-buying programs through at least March 2017. 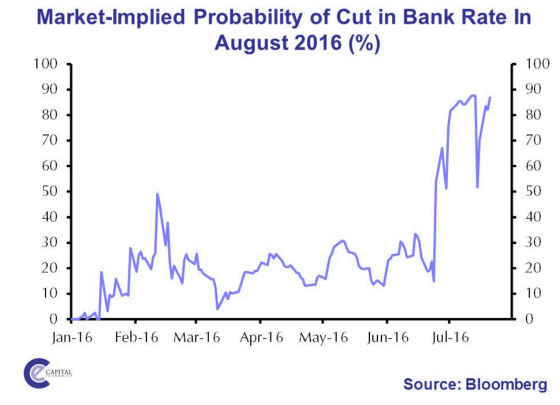 Meanwhile, the probability of a rate cut in the U.K. has increased dramatically in the wake of Brexit and a significant decline in consumer and business confidence. So what’s the takeaway from all of this? While admittedly there does appear to be too much bullish sentiment for Treasuries as the chart below shows (I do expect sentiment to have dropped a bit since this was as of July 19), I do think that Treasuries are still positioned to do well when investors turn to “risk off” which could turn to risk seeking in some ways by aggressively buying Treasuries with the expectation that they could move down to 1% while the world goes further negative. The lower yields should help propel money off the sidelines to take on more risk. It would seem like having exposure to Treasuries could continue to serve as a good and important hedge in one’s portfolio. Are we in a quantum state? Where do you think we are headed?